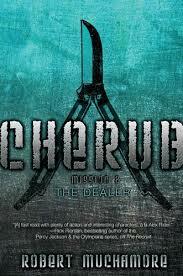 The Recruit rapidity continues in this jaw-dropping sequel, Cherub The Dealer by Robert Muchamore. Throughout this novel, 13 year old James is sent on another mission. Before James’s mom died, he had to deal with the long ordeal of living in the same house as his father who was addicted to alcohol. After losing his mother, he joined a secret organization and now he is a high ranked spy. Throughout the book, James deals with massive amounts of pressure during his spy mission to catch a well known drug dealer. James is sent to Miami, to befriend the drug dealer’s son to catch the father selling drugs. Will James be able to succeed his mission, without getting caught? Throughout this series, the author writes in a clear way so the reader does not become confused. Robert Muchamore focuses on one situation at a time, so the reader can easily follow all the events taking place. There are tons of descriptive details making this novel simple and understandable. I would definitely recommend this series to middle schoolers and high schoolers who like action stories. Although it would be helpful, readers do not have to read The Recruit first to understand the plot in Cherub The Dealer.